With respect, the above matter is referred. 2 Sabah State Library is pleased to carry out this program. The purpose of the program is to continue the preserve the reading culture among our communities, with a 10-minute stop to read any reading material. You are welcome to join and hopefully we will be able to work together for this program. With due respect, the above matter is referred. 2. 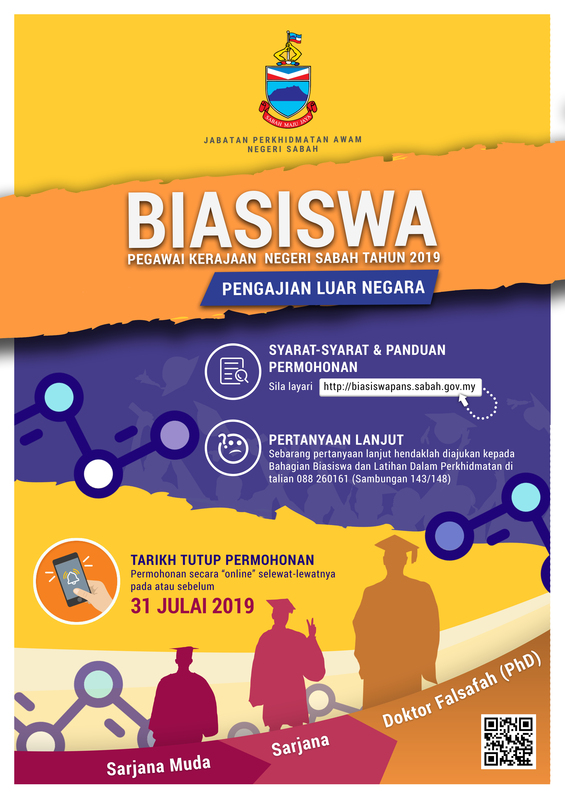 In line with the State Government vision to see potential government officials in the Ministry / Department / District Office to pursue overseas studies, the SABAH STATE GOVERNMENT OFFICER SCHOLARSHIP FOR OVERSEAS STUDIES YEAR 2019 is now open and offered to all Sabah State civil servants. All applications must be made online as stated in the ADVERTISEMENT. Dimaklumkan bahawa, penyerahan tadbir urus Unit Status Bumiputera ke Kementerian Undang-undang Dan Hal Ehwal Anak Negeri yang berkuatkuasa 1 Mac 2019. Sehubungan dengan itu segala urusan yang melibatkan Permohonan Pendaftaran dan Pengiktirafan Status Perniagaan Anak Negeri Sabah hendaklah dirujuk kepada Kementerian Undang-undang dan Hal Ehwal Anak Negeri.